Premier Access is a special vacation opportunity designed for vacation owners who like variety in their vacations and ease is making reservations. Experience the vacation of a lifetime…travel in search of the romantic, the adventurous, the beautiful, the relaxing, the exoticâ€¦all the most fascinating places. 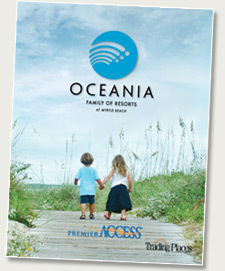 Trading Places International has selected its most consistently requested exchange destinations for the â€œPremier Access Family of Resorts.â€� Because Oceania is part of Premier Access, you have special access to a family of beautiful vacation ownership resorts set amidst spectacular mountains, tranquil deserts, and world-class beaches- all just one phone call away. Trading Places International has become a leader in vacation owner services and traditional leisure travel, establishing a reputation for providing consistently friendly, personal attention and for reliable delivery of its products and services.